Join New York's community of notable Yale alumni for an unforgettable evening of merriment, food, and drink in the gorgeous glass and steel atelier in the sky designed by world-renowned architect Renzo Piano in the New York Times Building.� Expect breathtaking sunset views over the Hudson & southern Manhattan, open bar with our signature Bulldog Gin Cocktail and wines, gourmet hors d'oeuvres and a cheese tasting by Joy of Cheese! ***� Early bird tickets: $45 through April 22, Regular tickets: $55. ***� Bulldog Sponsor Tickets: $100, includes special acknowledgement in the event program and website and a special gift. All Yalies and family/friends/guests are welcome to attend this special event. 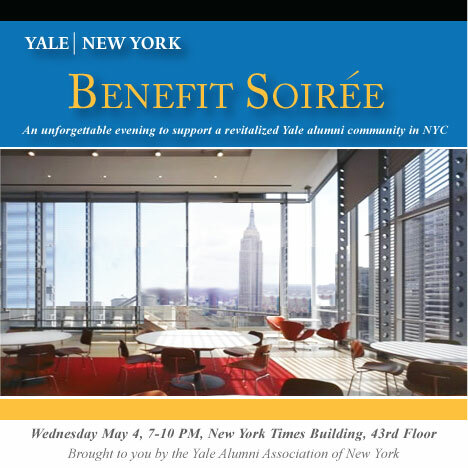 Yale Alumni Association of NY is a volunteer nonprofit committed to providing opportunities for all Yale alumni in the New York metropolitan area to connect and make a positive impact in the community.�� Your support will help us overhaul our technology and communications strategy, fuel our efforts to develop local and international programming for Yale alumni, and support our mission to nurture and showcase the rich tapestry of Yale activity in the city.�� We're here for you and we're excited about the possibilities. Benefit Committee: Chad Berkowitz '00, Patrick Castillo '92,� Aleta Davies '78, Elisabeth Enenbach '02, Aisha Gayle '02, Garrett Jewett '77, Jennifer Fulham '03, Carla Lien '77, Lisa Lee '91, Anna Maslakovic '88, Sibile Morency '05, Anne Nakaoka Moss '77, Tracey Ober '85, Tiffany Petrosino '10, and Holland Sullivan '01.